Vince McMahon owns World Wrestling Entertainment. If you were still somehow unsure of that fact, you clearly haven’t watched an episode of Raw at any point in its history. 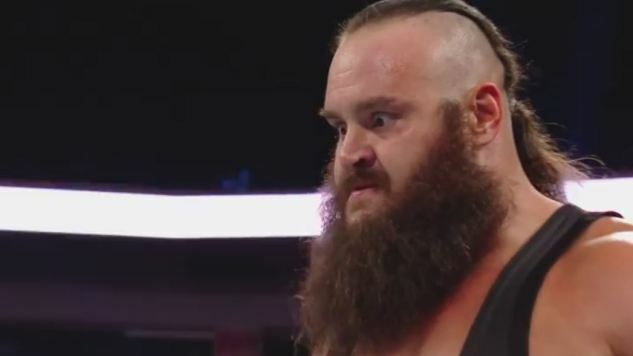 Last night’s Raw ended with a taste of McMahon’s current dream match: depressing heat vacuum Roman Reigns vs. cartoonish strongman Braun Strowman. Strowman ran in during a main event that pitted Reigns and former Shield colleague Seth Rollins against WWE Universal Champion Kevin Owens and his BFF Chris Jericho, destroying the faces that almost nobody cheers, as the heels that most fans root for gleefully watched on. On one level it was a genuinely surprising moment, as Strowman has not been involved with any of those four on any level; on another, deeper level, it’s the least surprising thing WWE has done in years, as McMahon has always relished pitting an all-powerful superhero against an unstoppable monster. Even if you don’t think that template went out of fashion in the early ‘90s, you’d probably have to agree that the terminally unpopular Reigns is not the superhero Vince wants him to be, and that Strowman is far too green to plod about anywhere near the main event. At this point it wouldn’t be a surprise if Rollins is relegated to the role of Reigns’s little buddy, the Enzo to his Cass, a best friend waiting to be mauled by Strowman and vindicated by the all-conquering Reigns. Not to come off as a bitter anti-Reigns internet snark fiend, but this long-term project clearly isn’t working. Despite his top-shelf look and ability to have a good match when paired up with the right opponent (ie, all-timers like AJ Styles or Daniel Bryan), Reigns has been a black hole at the center of the WWE Universe for at least the past two years. A feud with the similarly unover Strowman won’t help that. Reigns has made the entire product hard to watch, making even talented and popular wrestlers like Owens look completely flat. McMahon has had stubborn standoffs with unsatisfied fans before, but never before has he insisted on building the entire promotion around somebody as ill-suited for the role as Reigns. Wrestling Reigns is the quickest way to turn the monster Strowman into a babyface, which is the opposite reaction the company is going for. Elsewhere on Raw, the show’s top two women branched off into new feuds that could deliver much better results than anything involving Reigns or Strowman. WWE Women’s Champion Charlotte, the daughter of Ric Flair, lost a non-title match to Bayley, the chipper role model who could be a huge star if handled properly. The two had fine matches in NXT, and should make up the most prototypical heel vs. face rivalry Raw has seen in a long while. Meanwhile Sasha Banks, who lost to Charlotte in a weirdly booked but competently worked match at the Roadblock pay-per-view on Sunday night, hobbled out with a crutch and a knee brace earlier in the night to call Charlotte out one more time. Instead she was met by Nia Jaxx, the would-be monster of the women’s division, who kicked aside Banks’s crutch and threatened to beat her with it. Jaxx, who’s been booked like a distaff Strowman over the last several months, is similarly inexperienced in the ring, but perhaps Banks can pull a good match out of her. After all, her strength is selling and taking abuse, and if Jaxx has anything going for her it’s some small amount of credibility as a monster. In other events, the freshly heel-turned Neville was joined by Brian Kendrick in a beatdown of current Cruiserweight champ Rich Swann and TJ Perkins. The New Day, whose record-breaking tag title reign came to an end on Sunday’s pay-per-view, teamed up with the new champions Cesaro and Sheamus to win an eight-man tag match against the Shooting Stars and the Club. Cedric Alexander, one of the highlights of this past summer’s Cruiserweight Classic tournament, won a heatless match with Noam Dar. And in the opening match of the night, Big Cass was disqualified after refusing to stop kneeing Rusev in the head over and over again. It was a Raw like so many others before it: long and busy and yet empty and unfulfilling. And through it all it was impossible to not feel the hand of Vince McMahon and his outdated opinions weighing heavily upon every decision.